LONDON – Take a clever little film with a universal story, add melodies by a master tunesmith and then find the most brilliant boys and girls who can sing and dance up a storm and you have “Billy Elliot: The Musical,” the most irresistible show in ages. Packaged by the film company Working Title and using the creative talent from the movie including screenwriter Lee Hall, choreographer Peter Darling, and director Stephen Daldry, the show also boasts music by Elton John. With a cast drawn seemingly from the collieries of England’s County Durham and a group of youngsters who exhilarate in extraordinarily well-crafted scenes, the show is a guaranteed crowd-pleaser. Three lads have been cast in the title role and they rotate performances along with the other children in the large cast. James Lomas (pictured above who alternates with George Maguire and Liam Mower, pictured below) proves entirely captivating as the boy whose interest in becoming a dancer is entirely at odds with the tough mining community in which he lives. Following the story of the film, his family and neighbors mock Billy, not least because mining is the local tradition but also because this is 1984 and British Prime Minister Margaret Thatcher is waging war against the miners’ union. The period is convincingly evoked in Ian MacNeil’s sumptuous production design that includes video screens and large moving sets. Hall’s book is sturdy and his lyrics move the story along smartly. John’s melodies, too, while entirely agreeable are designed to serve the production rather than aiming to become pop hits. As Billy is secretly tutored by local dance teacher Mrs. Wilkinson (Haydn Gwynne) and is encouraged to apply to the Royal Ballet School, the harsh existence of the striking miners is never far from sight. Sequences involving choruses of miners fighting riot police add enormous power to a fairly simple story of a boy who wants to dance. The village scenes also convey the invaluable sense of community that existed in mining communities and that actually give Billy the grit to pursue his dream. Director Daldry has put together a sterling cast of grownups including Tim Healy as Billy’s gruff dad and Joe Caffrey as his embittered brother Tony. Ann Emery, as Billy’s grandma, also does a splendid turn singing a lively lament for a life wasted with the wrong man. In the end, it’s the youngsters who make the show such a success. They are all good, and Lomas is simply brilliant as Billy while Ashley Lloyd is funny and affecting as his gay friend Michael. 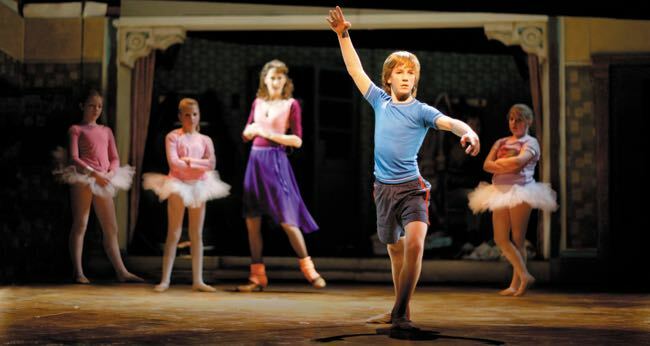 “Billy Elliot” will run and run for as long as there are talented boys to fill their extraordinary dancing shoes on stage. Venue: Victoria Palace Theatre, London; Credits: Music: Elton John; Book and lyrics: Lee Hall; Director: Stephen Daldry; Producers: Tim Bevan, Eric Fellner, Jon Finn, Sally Greene; Executive producers: David Furnish, Angela Morrison, Colin Ingram; Choreography: Peter Darling; Set designer: Ian MacNeil; Costumes: Nicky Gillibrand; Lighting: Rick Fisher; Sound: Paul Arditti. Cast: Billy: James Lomas, George Maguire, Liam Mower; Mrs. Wilkinson: Hadyn Gwynne; Dad: Tim Healy; Tony: Joe Caffrey; Grandma: Ann Emery; George: Trevor Fox; Mr. Braithwaite: Steve Elias; Dead mum: Stephanie Putson; Billy’s older self: Isaac James; Michael: Brad Kavanagh, Ashley Lloyd, Ryan Longbottom; Debbie: Brooke Havana Bailey; Emma Hudson, Lucy Stephenson. 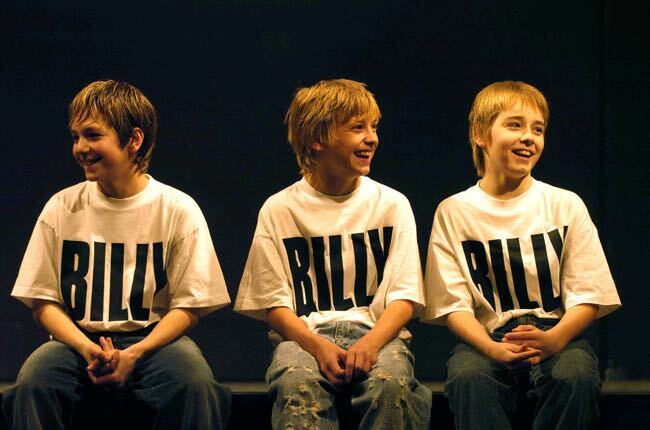 This entry was posted in Music, Reviews, Theatre and tagged 'Billy Elliot: The Musical', Elton John, George Maguire, Ian MacNeil, James Lomas, Lee Hall, Liam Mower, Peter Darling, Stephen Daldry, Working Tirle. Bookmark the permalink.